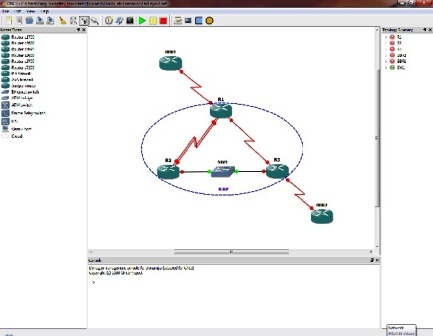 In this exercise we will configure the routers in the lab with the basic setup parameters and verify their connectivity. Finally we will save the completed configuration so that we can use in future labs. You can configure this lab using the Dynamips lab described in the previous article Basic Practice Labs Introduction, or actual hardware you have access to. Subscribe to this site and send me an email at support@freeciscolab.com requesting access, and I will send you everything you will need to complete this lab as well as all the up and coming labs at no cost that’s right FREE. But you must register and send me a request in order to be eligible for this offer. You will also receive a complete solution to the previous weeks exercise including configuration file each week by email. Configure the host name on all routers in the lab as shown in the above diagram. Configure all routers with the following passwords. Configure the IP address and subnet mask on all routers as shown in the above diagram. Using the subnet mask, determine the subnet and broadcast address of each configured IP address from step 3. Configure IGRP on all routers in the lab, using autonomous system (AS) 200. Configure the DCE serial interfaces of the serial connected routers with the clock rate of 64 kbps and a bandwidth of 64 kbps. Enable each of the interfaces and verify connectivity of each of the interfaces. Configure al the routers in the lab with the no ip domain-lookup. Use the proper CDP command to verify that all routers in the lab can see their connected neighbors. Use the routing table to verify full connectivity and valid routes to all routers in the lab. Verify that you can successfully ping all routers in the lab. Use the show ip protocol command on R1 to determine administrative distance of IGRP and the number of paths to the 192.168.1.64 subnet.Why are there multiple path to that subnet? What information dose R3s routing table show about the 10.0.0.0 network that is different from R1 and why? Configure all routers with the exec-timeout 0 0 and logging synchronous. Save the current configuration of all routers in the lab.